I got the chance to take some extended time riding with three leather vests and decided to weigh out the pros and cons of each. 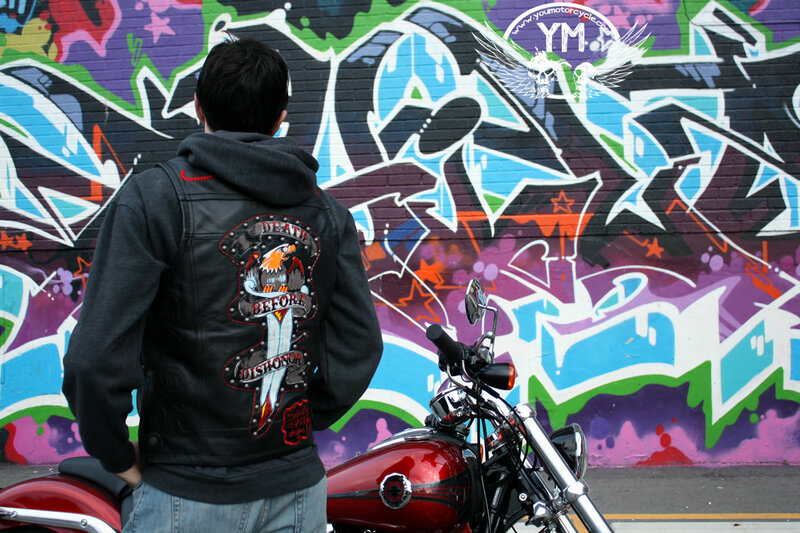 The first vest was the Ed Hardy Death Before Dishonor Motorcycle Vest reviewed on YouMotorcycle. 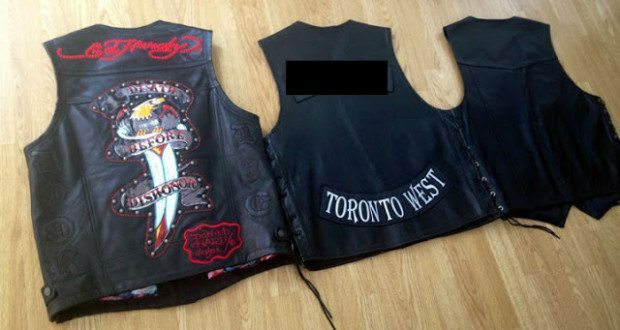 The second vest was a club vest from the Port Doverlocation of On The Fringe Leather, a popular retailer of high end leather. Lastly, Motorcycle House sent me an FMC Genuine Leather Label vest. 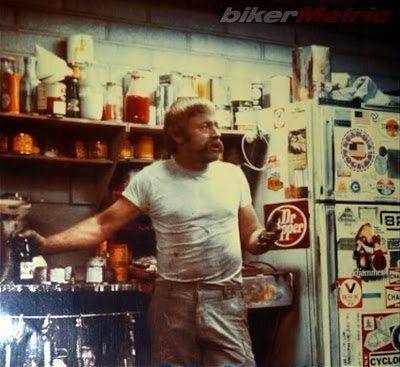 There are many ways to tell the quality of a leather motorcycle vest. The vests should have the right kind of stitching to be able to withstand abrasion without falling to pieces. 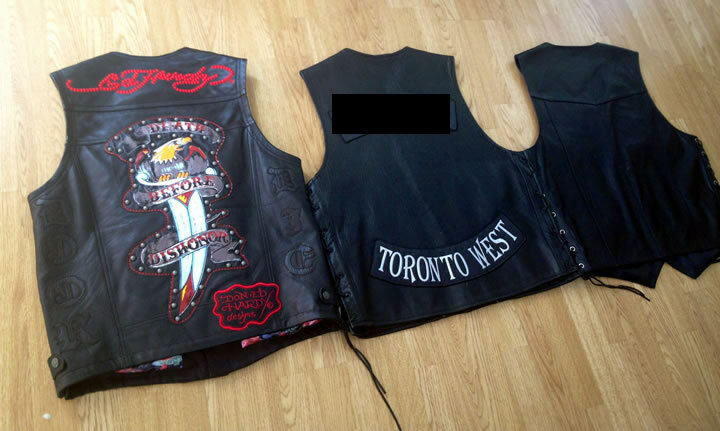 Some Motorcycle Clubs (MCs) only allow “club vests”, that is, vests where the back in one solid piece of leather, and not many pieces stitched together. Vests made of fewer pieces of leather put together are more valuable as they were made from fewer flawless pieces of cowhide and therefore are worth more. Of course we’re also going to be looking at the cost of the leather vest itself, along with the fit and finish of it, thickness and feel of the leather, and any extra perks. The Ed Hardy vest came in at $269.00, the most expensive of the vests in this shootout. 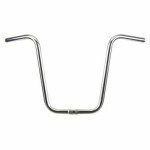 It was extensively reviewed on YouMotorcycle and received rave reviews for fit and finish. In my opinion these were well deserved praises. The vest holds up well and keeps good form even as a daily riding vest. 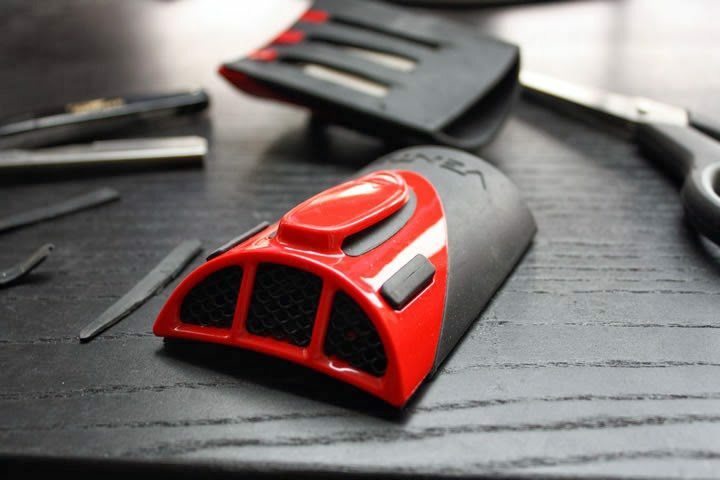 It hasn’t faded or developed any odd bumps or traces of wear despite over a thousand miles of use so far. The red embroidery of the Ed Hardy text on the top of the back of the jacket doesn’t look quite as perfect as it used to, but overall I’m happy with the way this vest is holding up. The cut makes riders look good and fit, and while the style may not be for everyone, ergonomically this vest has plenty going for it. It scored bonus points for having CE approved armor in the back in YouMotorcycle’s review, something even my every day full leather motorcycle riding jacket doesn’t offer me. The stitching on the vest is thick and rich, more than just aesthetic, it looks like it was smartly designed. Key features include a brightly designed interior and zip up sides for adjustable beer-guttedness. All zippers are mostly protected with leather covering. Nicely done, Ed Hardy. There’s a reason On the Fringe is well known in Southern Ontario. They offer a high quality product. Serious stitching, thick feels-so-good leather, and no corners cut. The real beauty to the club jacket is that the entire back is a single piece of leather. 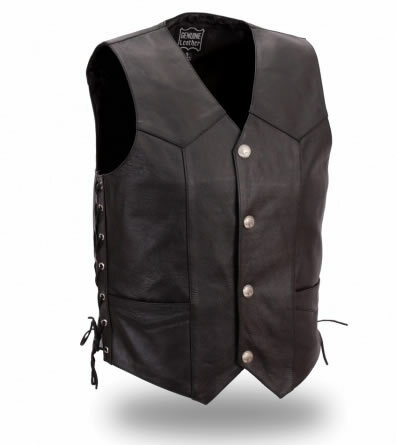 Most vests, especially in the lower price point, are made up of multiple smaller pieces of leather all decoratively stitched together to make a vest. Even the Ed Hardy vest is guilty of this fault. The club vest gives you 21″ by 24″ of solid, unblemished cattle on your back. On the Fringe also does a lot of custom leather work. The quality is on par with the Ed Hardy vest and the company stands behind it: They stitch the phone numbers to their stores in every motorcycle vest they sell, and I doubt anyone ever calls to complain. The club vest may not come with any kind of armor, but your MC’s rockers will look better on this vest than anywhere else. The price for the current model club vest is $175, but if your club is your world, that one cut back could be a deciding factor. 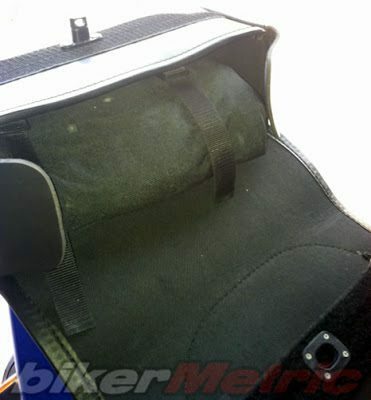 Coming in at $45 puts this motorcycle vest at the more economical end of our shootout. 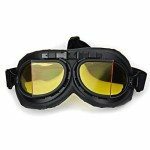 It’s a value product for the biker on a budget who just wants a leather vest without getting too fancy. The leather is thinner to the touch. The vest itself doesn’t have the rich, smells like Pops’ vest leather gusto of the Ed Hardy or the On the Fringe vests. Instead there’s a chemical-like aftersmell to it. That’s the best way I can describe it. There is no double stitching here, everything is single-stitched. Unlike the other models, this vest contains no zippered pockets, so keep any valuable documents someplace else when you’re riding. On the positive side you still get two inside and two outer pockets, the five-piece back looks alright, there are extra buttons included and leather side lacing for adjustable width so this vest will grow with you. “You get what you pay for” really applies here. 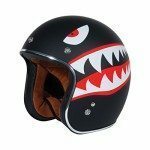 The sizing chart link for this product is broken on Motorcycle House’s website. We requested a medium, which was sent to us, however the size medium is huge and measures the exact same dimensions as a size large from on the fridge. The size medium Ed Hardy vest from Motorcycle House fits like a glove however, so it’s worth mentioning that for this particular it may be best to order a size smaller than what you usually take. I’ll never be able to wear it because of this, which is too bad, because it’s a good looking vest. You can’t go wrong with the Ed Hardy Death Before Dishonor Motorcycle Vest if that’s your style. If you want a clean back to wear your rockers with pride the On the Fringe Leather Club Vest is your only option. Both of these vests offer top quality in their own ways. If you’re looking to stay in the sub-$50 price range and aren’t overly picky the FMC Genuine Leather Label Vest gives you an option that keeps you on your budget and looking good.